This post contrasts things you may or may not know about Tridion (SDL Web) connected by an embarrassing moment in my role as a product manager. Let's talk about too much knowledge, not enough, and why I'm not asking you to share this time. 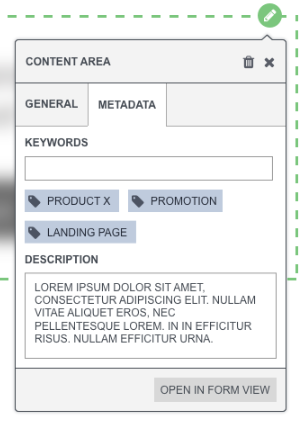 We were recently discussing the idea of "tagging" content in SDL Web Experience Manager (XPM) as seen in the rough wireframe below. This specific idea won't end up in the final product without a bit more discussion, validation, and iterations. Or it might get swapped with something with a higher priority. Rough wireframe exploring the idea of "in-context" tagging. Our UX designer stressed it's very rough. Don't tell him I showed this to you. In the Content Manager Explorer (CME), you probably know editors can tag Components with Keywords, which are saved in separate fields. The CME detects which keywords apply at the field level, but lets you add them without needing to open the form view. 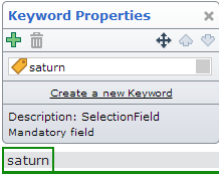 You can set or even add keyword values for an individual field in the CME with the proper authorization. And you can do the same in SDL Web Experience Manager (XPM), as seen below. You can interact with the Keywords and even add new Keywords in XPM. This image is from the User Manual, which details other XPM features (read it). The most technical of you know that you can interact and query against these values in the SDL Web Content Delivery (Content Interaction Services) API using custom criterias against custom metadata OR the taxonomy API. However, XPM doesn't let you tag at the Component (Presentation) level nor does SDL Web itself have a tag control as seen in the wireframe. And the UI lead pointed out, "well, we could add it." Oh. Right. I'm the product manager. Of course we could discuss potential changes. Enough about embarrassing moments from knowing too much. Let's explore things people might not know about Experience Manager. Different types of controls. Editors can interact with tags (Keywords) in XPM, as mentioned above, as well as dates and multi-value fields (which let you drag or use up/down controls to change the order of the fields). Images can go on a page. You can add an image directly to a page as a Component Presentation assuming you have a Component Template associated to its Multimedia Schema. Context matters. The context for translations is influenced by that site's Experience Manager context settings. UI links to related items in workflow resolve to pages in Experience Manager (in the CME you get the form view instead). Visual validation. Fields will turn red when they're invalid. This includes missing mandatory fields or if an editor violates the min/max text length constraints for a given field as defined in the Schema source. Hover over the field to see the issue (e.g. if you're over or under a text length constraint). Components are still Components. In Experience Manager you can queue a visible item for Publishing or Unpublishing directly, even if it's a Dynamic Component Presentation. You can still open them in form view as well. Much of the "new" features aren't new. Page types, content types, border colors, and context settings were already configurable in SiteEdit, the in-context editing precursor to XPM. They just happened to be in template settings and xml configuration files. Some of these might be obvious to you, but all of these were new news at one point to me or my colleagues, some with several years of Tridion experience. Since XPM is relatively new in Tridion's history, the latest and newest Tridionauts have the same or even more opportunities to know XPM as well, if not better than, the veterans. Speaking of experience, this one is sometimes missed by very senior Tridion consultants (I'm not saying who). The BluePrint viewer lets you localize, unlocalize, open, or jump to the items directly. And yes, I blogged about this before, describing the viewer as "GPS for your BluePrint." Which means most experts may not need it (see the Parking Garage problem). What's the point of this "you might not know" list? People really might not know. People already knew and should share more. The first and second one are related. People can get past the curse of expertise by picking a "mundane" familiar topic to share a different perspective. They can re-use "how to" email responses, code instead of blog, or answer questions on their own time for their own interests. A little creativity and humility can help people ship. The third reason is tricky, though. Reading lots of Seth Godin might help quiet the lizard brain to gain that confidence but people might need your help..
Did you notice the third-person perspective in the last two paragraphs? Surprise, I'm not telling you to blah blah blog. If you've read and followed me this far, your next step is to mentor others. Please appreciate, encourage, and recognizing the potential in your colleagues, regardless of where you are in terms of sharing. The following statement is surprisingly effective at breaking the third reason and giving others confidence to ship: "That's awesome. You should share it." You might need to say this a few times. Seriously. I'll need to paradoxically remember and forget everything I thought I knew about Tridion. There are things you may or may not know; the community still needs the sharers. Tridion doesn't work in ways you may want it to, but tomorrow it may very well. In my next post, I'll highlight just some of the visible instances where mentors are encouraging the next "generation" of sharers along with some of their insights at fostering active community participation in their own organizations. Congrats 2016 SDL Web Community Winners!